To be inspired means to be filled with breath. The Latin word, inspirare, means to breathe or blow into. To be inspired means to be filled with the breath of God. Literally we are inspired by the breath of God each time we breathe. And metaphorically, we are filled with Divine Breath when we receive an intuition, greater insight, a new perspective, an idea, or solution to a problem. And we need spiritual inspiration! With an innovative idea, new technology comes into being. With a stroke of insight, a problem’s solution is found. With long-held vision, goals are reached, businesses succeed, and great achievements won. Just like the Wright brothers who believed that humans could fly and then designed the first flying aircraft, we can bring our fanciful imaginings into fruition. Yet, those ideas, visions, and imaginations come first by being inspired! All things begin first in the minds and hearts of those who are open to receive. Spiritual inspiration requires the ability to get quiet inside in order to listen to what is arising. In fact, if there is anyone who can save the world at this time it’s the artist! You see, a true artist knows how to listen to the voice of the heart. An artist is familiar with the inner landscape and the great unknown! 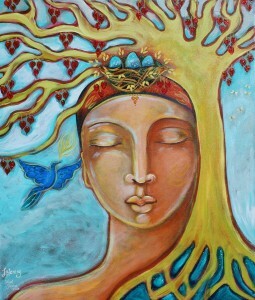 With a deeply receptive inner quality, the artist remains connected to the inner wisdom, and the beautiful intelligence of the heart. The elegance of the artist is his or her ability to put the intellect aside and listen for intuition, inspiration, and love’s intelligence. Not only does this create union with a deeper, greater truth, it also facilitates a channel through which the voice of God can be heard. And this is the purpose of Creation Meditation. It’s a practice of spiritual union, uniting its practitioners with the intelligence within. It’s a practice that is meant to open the door by which spiritual inspiration can be experienced. 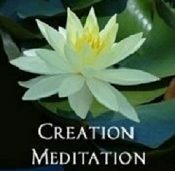 Creation Meditation is a spiritual practice of meditation and creativity. Meditation helps to create space between the thoughts while creative expression provides an opportunity to express what’s arising from within that spaciousness. It’s a practice of union. After you’ve meditated, the practice of creativity invites you to experience the spiritual inspiration inside you. To do that, you must go to your inner shoreline. The shoreline is symbol for where the unconscious and conscious minds meet or where unknown and known come together. This is where your attention can rest while a creative endeavor unfolds. To cultivate this state of mind, that is to reach the inner shoreline, the artist, the creator, becomes receptive and listens for the intelligent unfolding of the creative process. As inspiration appears, there may be a feeling of uneasiness and awkwardness because it is risky to follow the unknown. The artist never knows what will happen. Yet, by doing so, he or she becomes a vessel through which the divine can flow. The intelligence of the transpersonal becomes one with the personal, allowing what is new to unfold from the dark into the light of the world.